Human LRRC32, Fc Tag (LR2-H5256) is expressed from human 293 cells (HEK293). It contains AA His 20 - Asn 627 (Accession # Q14392-1). 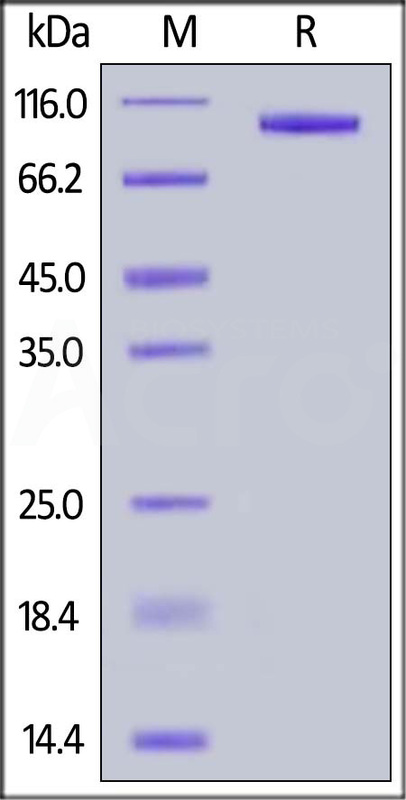 The protein has a calculated MW of 92.4 kDa. The protein migrates as 106 KDa under reducing (R) condition (SDS-PAGE) due to glycosylation. Human LRRC32, Fc Tag on SDS-PAGE under reducing (R) condition. The gel was stained overnight with Coomassie Blue. The purity of the protein is greater than 95%. Immobilized Human TGFB1, His Tag (Cat. No. 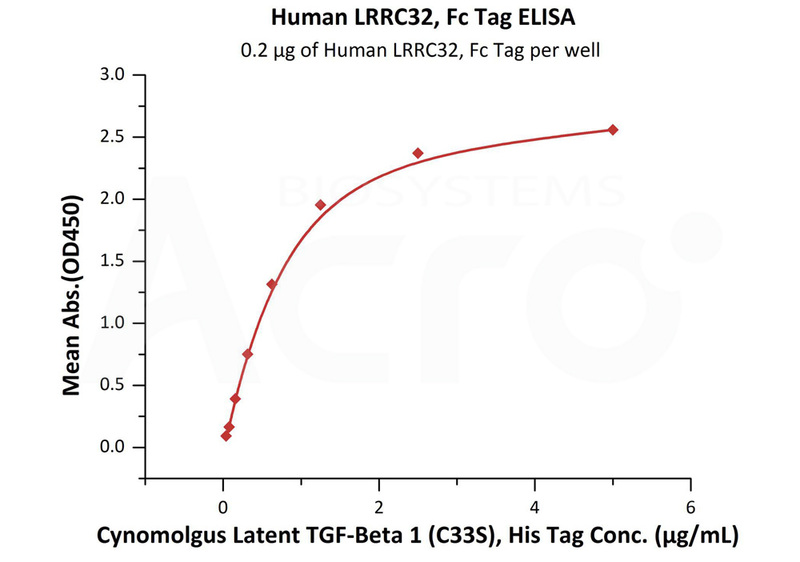 TG1-H524x) at 5 μg/mL (100 μL/well) can bind Human LRRC32, Fc Tag (Cat. No. LR2-H5256) with a linear range of 0.078-1.25 μg/mL (QC tested). Leucine-rich repeat protein 32 (LRRC32), also known as GARP (glycoprotein A repetitions predominant). LRRC32 expression promotes the acquisition of a Treg phenotype including reduced cellular proliferation, reduced cytokine secretion, and the capacity to suppress the proliferation of naïve T cells. LRRC32 binds directly to the TGF-beta latency associated peptide (LAP) and tethers latent TGF-beta on the surface of activated Treg cells. The presentation of TGF-beta on Tregs contributes to their ability to suppress naïve T cell proliferation. (1) Battaglia, M., et al., 2009, Eur. J. Immunol. 39(12): 3296-3300. (2) Wang, R. et al. 2008, PloS ONE 3(7): e2705. (3) Probst-Kepper, M. et al. 2009, J. Cell. Mol. Med. 13(9B): 3343-3357.